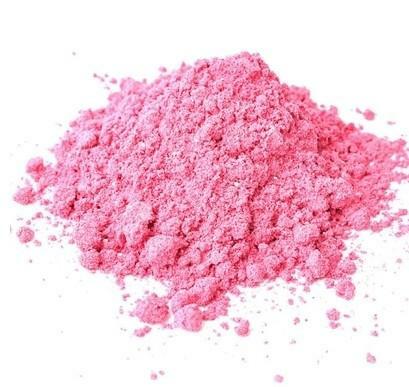 Raspberry Fruit powder contain significant amounts of polyphenolantioxidants such as anthocyaninpigments linked to potential health protection against several human diseases. The aggregate fruit structure contributes to its nutritional value, as it increases the proportion of dietary fiber, placing it among plant foods with the highest fiber contents known, up to 20% fiber per total weight. Raspberries are a rich source of vitamin C, with 30 mg per serving of 1 cup (about 50% daily value), manganese (about 60% daily value) and dietary fiber (30% daily value). Contents of B vitamins 1-3, folic acid, magnesium, copper and iron are considerable in raspberries. Raspberries rank near the top of all fruits for antioxidant strength, particularly due to their dense contents of ellagic acid (from ellagotannins), quercetin, gallic acid, anthocyanins, cyanidins, pelargonidins, catechins, kaempferol and salicylic acid. Yellow raspberries and others with pale-colored fruits are lower in anthocyanins. appetite suppressant so you do not eat as much.